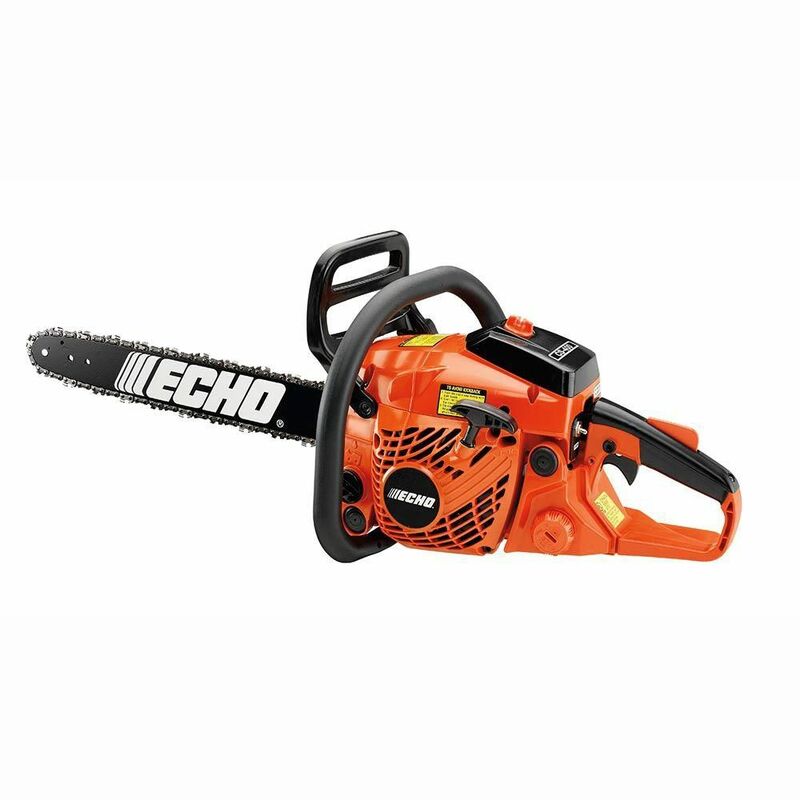 This ECHO 36.3cc Chainsaw with 16-inch bar/chain features the FasTension tool-less chain tensioning system, an automatic, adjustable oiler to match cutting conditions and an aluminum handle with rubber overmold for improved comfort. 16-inch 36.3cc Gas FasTension Chainsaw This ECHO 36.3cc Chainsaw with 16-inch bar/chain features the FasTension tool-less chain tensioning system, an automatic, adjustable oiler to match cutting conditions and an aluminum handle with rubber overmold for improved comfort. 16-inch 36.3cc Gas FasTension Chainsaw is rated 3.9 out of 5 by 9. Rated 5 out of 5 by gratefulone from Excellent Chainsaw for the price. The Chain slipped on easily and the start was good. Product w... Excellent Chainsaw for the price. The Chain slipped on easily and the start was good. Product was good for Medium trees and limbs. Rated 3 out of 5 by CC from The blade loosens too easily, but handles all of our... The blade loosens too easily, but handles all of our needs with ease. Rated 5 out of 5 by bigbob from I have two others chainsaws. This one is the best of all. I have two others chainsaws. This one is the best of all. Rated 5 out of 5 by EarthElectric from I love the NO tools needed for installing and tension... I love the NO tools needed for installing and tension of the bar and blade, Blade break makes for great safety.Starts right up on the second pull right out of the box. Id buy it again in a heartbeat!! Rated 4 out of 5 by Anonymous from Overall great Easy start, nicely made, good saw. For some reason I thought it'd be bigger/more powerful- guess I should've got the 45cc. The fast tension system is awesome- glad I paid extra for it. Rated 4 out of 5 by Pitch from The fast tension system took several tries to get adjusted, probably more due to new chain adjust... The fast tension system took several tries to get adjusted, probably more due to new chain adjusting. I am Leary of flip out handle on tensionor, to flimsy. Like most saws, putting chain oil in is messy due to safety bar. Have used several tanks of fuel, starts easy even for a lefty, has plenty of power for brush clearing, have not tried it on logging operation. Bought it for mid range work and low weight, Believe it will fill the bill. It replaces an old Echo 9500 Pro saw which has same configuration. Rated 4 out of 5 by Ronny from Good, but has some flaws. I wish I had time to order a bigger cc model but I had a job the next day, my other chainsaws were out of commission. This was the biggest I could buy at HD. The chain tension adjuster needs to be redesigned. My friend has echo chainsaw and chain tension adjuster broke after a month.I like how you can adjust the tension on the side but I've had many chainsaws and the adjuster feels like it's not moving freely. Sometimes I would loosen the tension a 1/2 a turn and it would loosen the chain a 3/8 of a inch, but it took me 3 full turns to get it back?? It just feels under pressure when you move it. I still believe that Echo's are still the best unit on the market. I've own many of Echo's products and they all are still working great over many of years! !